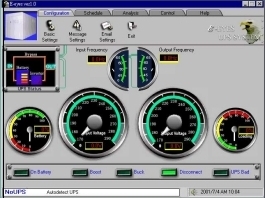 E-Eyes is a unique uninterruptible power supply (UPS) software that offers you unprecedented convenience for the control of any UPS. E-Eyes can send warning messages via e-mail or over the LAN. Thus providing an early warning system for power failures, system shutdown and a variety of other scenarios. It guarantees a faster response time, even when you are not in the office. Saves files before shutdown occurs. No more lost work due to unexpected system shutdown. When power failure occurs, E-Eyes saves all open files before gracefully shutting down the system. E-Eyes' shutdown and startup scheduling function reduces the amount of power wasted, and therefore results in savings on electricity bills. In addition, E-Eyes also allows for remote control over a TCP/IP network without the need for an expensive SNMP card. Easy System Monitoring and Tracking. Users are able to customize various E-Eyes controls such as warning method and alarm messages. Both of alarms notifications are sound and message. Graphic display of UPS status. Easy -to use user interface. 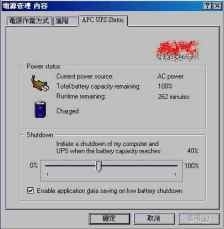 Save files before shutdown occurs. View Log, View Data, Shutdown Status. Enable always show icon in the taskbar.